Over on The Adoption Social, we recently ran a special Secret Santa for bloggers where instead of giving little presents, the idea was that we'd give the gift of a blog post. 14 bloggers signed up and this weekend, those gifts have been dropping into inboxes not only across the UK, but even internationally. 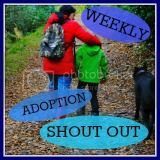 This week we hope to see those guest posts popping up on some of our favourite adoption blogs. will live in either the UK or the US. That is, countries with a Christian culture, big on Christmas and also nowadays, big on SANTA. And oh, how debated Santa has become! We all start planning Christmas early, and making decisions about what is going to happen, but suddenly, our decision to either ‘Be Santa’ and leave our children presents but pretend good old Saint Nick did it instead, or ‘Not to be Santa’ and tell our children that Father Christmas does not in fact, exist, is a decision that we will be JUDGED for. The strength of the feeling sometimes expressed, is the kind of passion you’d expect to see in an argument about whether it’s okay to smack children with a hairbrush - not an argument about exactly how we choose to give our beloved children gifts on one day of the year. As you might now be able to tell, I personally have no strong feelings about what is ‘best’ (indeed, I do not believe there is an objective ‘best thing to do’), and am slightly bemused about why the choices of some parents on this matter, are such a problem to other parents. So you ask, what do I personally do? What did I do with my now adult and older teenage children? Well – I’ve done it both ways. This left me with a desire to make Christmas as wonderful for my children as it had been for me. And because Santa was a component of my wonderful childhood Christmases, why would it not be a component of my future children’s Christmases? I always assumed I would do Santa, and the idea that I would not pretend to be Santa while my kids were young enough to believe – well, it would not even have occurred to me. When I was first approved to adopt, I had an age range of 3-12. Unusually large, and it left things wide open Christmas wise, given that if I adopted a 12 year old, Santa wouldn’t be a part of Christmas anyway simply because of their age. But I was sure that if I adopted a young child, I would do Santa. And an exciting thought it was to my young and honestly naïve adult self! As it happened, most of the children I considered were in the upper half of my age range, and eventually I was chosen for my eldest daughter (I call her Rhea online) and brought her to live with me, when she was 10. She already knew Santa didn’t exist, so I never had to make that decision. 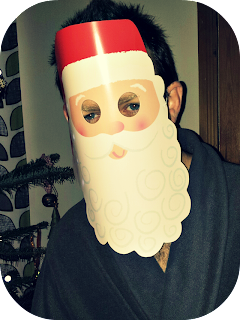 But I did have to confront my assumptions about a family Christmas nonetheless. Rhea didn’t think Christmas was fun, exciting, happy or something to look forward to. It was uncertain, confusing and scary; a reminder of awful things. Everything could and surely would go wrong for her. And so I changed my plans and adapted to a new kind of Christmas. A low key, just-the-two-of-us kind of Christmas, with little traditions and no uncertainties or surprises. Then in 2004 I adopted my second daughter, “Kestrel”. She was 7 when I met her, and had her 8th birthday during our introductions. She had a mild learning disability and was very emotionally and socially delayed. In addition to that, every year of her life as far as I know, Santa had actually come to her, and left some presents, no matter how few or what they were. There was something and she was told that Santa brought them. And so, I finally had a child who believed that Santa came at Christmas. That was surely a good thing, no? Well…no. Who is Santa? What does a child understand Santa as? Ask a child, and they will probably tell you that Santa is a man, who wears red and says ‘ho ho ho’ and drives a sleigh (etc etc), and who comes to your home at Christmas, sneaks into your bedroom (or maybe your lounge) and leaves you nice presents. Now ask yourself this - what does it mean to a child, the idea of a man coming into your bedroom at night? For most children, well they’d think ‘uh….oh, Santa does that!’ But there’s a group of children who wouldn’t think of Santa, because a man sneaking into your room at night means something else entirely. And there lay my new Santa problem. Kestrel believed that Santa was real and that he was a present giver, yes, but she was also terrified and scared of Santa coming. As well as finding Christmas scary, uncertain, over stimulating and confusing in general. So what could I do? I did the one thing I would never have foreseen myself doing pre-children. I told my daughter “Santa isn’t real”. It’s an adult you live with, just pretending. It’s me. Your mum, giving you presents because I love you and you deserve nice things. This house is a man-free, Santa free zone. I had become one of those terrible parents who so cruelly “deprive” their children of the “magic” of…oh no wait, I was a good mum who was doing what she thought best for her daughter. That Christmas is not less magic without Santa after all. That Santa is not what Christmas is all about, and is not the most important thing to happen on Christmas Day. And that Santa is not a good idea for some children. It’s as simple as that. In 2007, I adopted my son, “Parrot”, who is Kestrel’s biological half-brother and who was 23 months old when he came home. And Parrot has always had Santa. He has come running into my room on Christmas morning, and said “Mummy, Santa’s been! Look at my presents!” and nearly cried with excitement. That Santa is fun and good for some children. A way to try and teach the power of imagination and fun, which is something Parrot has shad difficulties with. An aid in developmental skills, basically. And fun for me, too! Overall, what I’ve found from my own parenting experience, is that we all do what we think is best for our own children, and that whichever way we choose we are usually committed to giving our children as good a Christmas as possible. To be, or not to be, Santa? It’s up to you – and this mother supports you either way, because she thinks that at the end of the day, it doesn’t make a difference. It’s not about cruelty, love, lying, truth, magic, deprivation or doing-it-in-an-exact-way. It’s about doing what you think is best for your individual child. And in the grand scheme of things, if your child can look back at Christmases with you and think good things about what you did – that’s what matters. And a very Merry Christmas, and many thanks to Last Mother for writing this Secret Santa guest post. With our first set of children we decided to give straight answers to straight questions, they asked and we said he didn't exist. They looked at us as though we were stupid and chose to ignore us! The next year they didn't ask. "...am slightly bemused about why the choices of some parents on this matter, are such a problem to other parents..."
This is my experience of almost everything to do with parenting! Seems as though whatever decision you make about some things, somebody else will feel threatened enough by it to take offence :/ It's a world of eggshells I never knew existed until I entered it! "It’s not about cruelty, love, lying, truth, magic, deprivation or doing-it-in-an-exact-way. It’s about doing what you think is best for your individual child. And in the grand scheme of things, if your child can look back at Christmases with you and think good things about what you did – that’s what matters. And thinking about it, I guess the same thing will go for the Tooth Fairy who, let's face it, has a not dissimilar sneaking-into-bedrooms modus operandi!